The Bike Natchitoches Cane River Plantation Ride comprises three routes that cover land steeped in the history of Natchitoches Parish and offer numerous views of Cane River Lake. A 2k family fun run/walk is also planned. The 15 mile route will start and finish at the Cane River Creole National Historical Park (Oakland Plantation) in Bermuda, Louisiana. The tour will follow the Cane River National Heritage Trail and the Isle Brevelle Trail along Cane River Lake. It will pass several antebellum homes as well as Melrose Plantation and will cross Cane River Lake to Isle Brevelle Trail by historical St. Augustine Catholic Church. It will return to the Cane River Creole National Historical Park. The 25 mile route will follow the same route as the 15 mile route plus continue on to Magnolia Plantation. 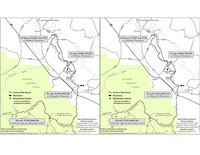 The tour will cross the end of Cane River Lake and continue on to the Isle Brevelle Trail to the Cane River Creole National Historical Park (Oakland Plantation). The 63 mile route will follow the same route as the 25 mile route and will add the beautiful hilly forest scenery of the Kisatchie National Forest including the Long Leaf Vista Trail. It is a perfect blend of Louisiana plantation history and serene arboreal experience. Registration fee for any ride is $35.00 for adults,18yo and above and $20.00 for17yo and younger. Ride shirt and gift bag are guaranteed if registered by April 25th. The 2k family fun run/walk is free and will be held on the Park premises. Participants from any route are encouraged to tour the National Park at Oakland, Magnolia and Melrose Plantations. 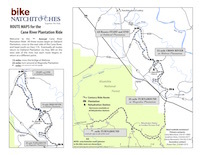 The Cane River Plantation Ride starts Saturday May 7, 2015 at 8:15 AM. Registration starts at 7:15 AM. Free lunch will be served starting at 10:30 AM. Proceeds from the Cane River Plantation Ride will fund Bike Natchitoches activities throughout the upcoming year. Every $50 donation towards the costs of the event will receive one free entry to the Cane River Plantation Ride. Insurance is a top priority for our regularly scheduled all-inclusive groups rides. Bike Natchitoches also focuses on educational programs partnering with schools, local communities, clubs, and groups. Our educational outreach includes materials and events to help inform all community members, and provide safety equipment donations to those in need. In addition, Bike Natchitoches regularly identifies grant opportunities and works to receive funding for community projects. Donations to Bike Natchitoches provide matching funds for grant opportunities where applicable. Thank you for your support of the Cane River Plantation Ride.